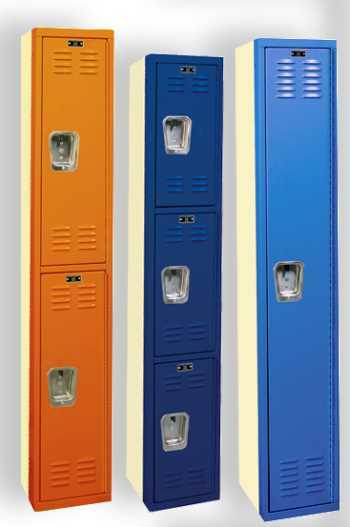 Lockers are the most common form of equipment for individual storage and security. Personnel lockers like those most commonly used in schools and locker rooms allow associates to securely put away property which is not essential to performing their job, as well as store individual items that are essential to performing their job while they are not at work. Personnel lockers are typically much smaller than industrial storage lockers but serve a very similar purpose. Examples of industrial storage lockers are military TA-50, visibility, bulk, and tenant. Industrial storage lockers are fairly common in a shop environment, but personnel lockers are most commonly used in a shop environment. CSI provides industrial storage lockers and personnel lockers for shop areas or any area where they may be needed. If you do not see specifically what you are looking for Contact Us, we are here to assist you. Request a quote and put our professional personnel to work for you. If individuals need more space consider our Industrial Storage Lockers. We also offer commonly used industrial shop equipment like Ladders, Storage Drawer Cabinets, Carts, and other general shop equipment.